Recently, I have notice that there have been a lot of scammer calls coming in to people I know personally. Even I have been getting calls from a strange number that I did not recognize but I never answered the calls. These scams can range from someone trying to sell things to someone claiming to be the IRS or have a warrant for your arrest. So, what started me on this research project was that I received a suspicious phone number. How do you tell if it's legit: The first time I received the call I simply just googled the number. This method may not always work because these scammers can change their number but so far for me I have gotten some sites where people have claimed that they have been called by the same number and that is a scammed. So, I simply typed in: 469-250-0754. (This is the Texas number that called me) I found some pages where people have claimed that this was a number that is claiming that they have to appear in court, and they will be served. Someone I know, however received a call about a payday loan claiming that they were a collection agency. I thought this sound suspicious, and I looked it up. It was a hoax, but to further my investigation we actually called the payday loan place that they were claiming to work for. We found one in the next town over, and he did have a file, but it was waived. They just pick random numbers in hopes to hit the jackpot with someone foolish enough to send them money. 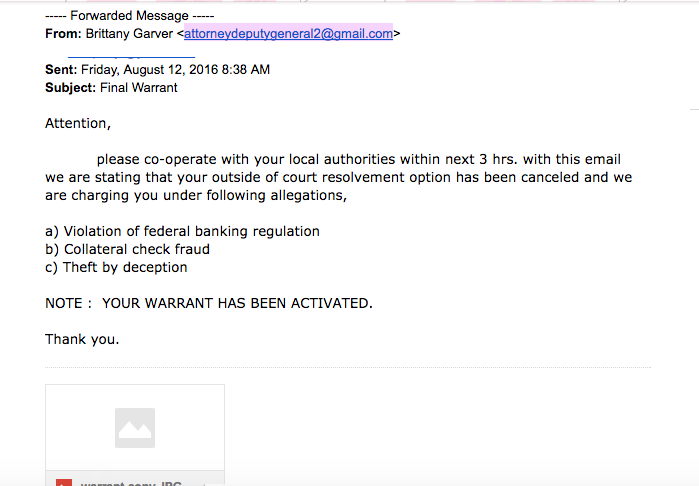 My co-worker received an E-MAIL claiming that they had a warrant for her arrest and that they she must respond. 1. 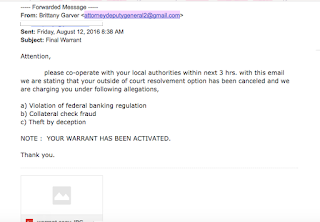 If you had a warrant for your arrest, you wouldn't receive an e-mail. Also, the warrant would have your name on it, and there wouldn't be so many grammatical errors or spelling errors. It wouldn't look like it was done in some rip off of photoshop either. Her name, I guess is Brittany Garver. Here is the email. I crossed out my co-worker's email for her privacy but she gave me permission to use this. No way a warrant would look like this. I came across a youtuber that helped educate me more about scammers ways, and their patterned before he ruins their day and time. (It's really funny to watch.) It shows how stupid these scammers really are. This youtuber goes by The Hoax Hotel. He's a genius, in my opinion. I highly recommend listening to this guy who wastes the scammer's time in which is a good thing because it makes them lose money. So, if you get a call just waste their time. So, if you find a call that seems weird, or something just isn't right then it's probably not real.